Welcome to TranquilaTEA Tea Room and Gift Shop! We would like you to be our guest, to enter our tea room and feel all the outside pressures melt away as you walk back in time. Taking tea is a pleasurable experience, engaging in intimate conversations and remembering the fond memories of childhood as little girls sit and giggle with their moms, trying to act so grown up, dressed in their finest. 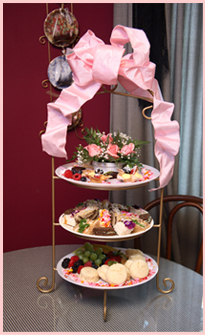 A tea room promotes an atmosphere in which we can reacquaint ourselves with family and friends. In a world so full of overbooked calendars, to the demanding schedules that we keep, we all need a reprieve from the marathon we run. So come, sit down, relax, and be our guest. Tune out the hustle and bustle of the outside world and enjoy some TranquilaTEA. We gladly accept walk in customers when space permits, but we highly recommend you call ahead to make reservations to guarantee a tea time for your party. Please note we have a 24 hour cancellation policy. You must call us no later than the day before your scheduled reservation if you need to cancel or change your reservation’s head count. Parties are responsible for the head count they reserve. Thank you. Evening hours are available for groups of 10 or more. Contact us at 717-765-8327 for more information. Looking to do some shopping? TranquilaTEA’s gift shop is brimming with unique treasures and gifts! Not able to stop by the shop? Our online store currently carries our entire menu of only the finest loose leaf teas. With over 55 different flavors, there is something for everyone! Gift certificates are available in any denomination, stop by the TranquilaTEA or call 717-765-8327. Thank you!